I really love breakfast foods, any time of the day. There’s something so hearty and homey about breakfast that just makes me happy. We eat a lot of biscuits, grits and pancakes around here, waffles were, for some reason, sorely lacking from the rotation. When I saw this recipe, I knew I had to try it out. I’d never had yeasted waffles before, and they were so full of things I love, I couldn’t help but print off the recipe immediately. They are slightly tangy, not a bit too sweet. I normally eat my waffles and pancakes simply covered in butter, but these are perfectly accented by some warm maple syrup. They are easy to throw together the night before, ready to pop in the waffle maker for something scrumptious first thing in the morning, or for dinner if you’re feeling adventurous. I’m making up another batch tonight, I can’t wait to have them again! This recipe is from Tara of Seven Spoons, have you seen her blog? It’s beautiful and inspiring, you should check it out. These look incredible. I can't wait to try the banana addition. 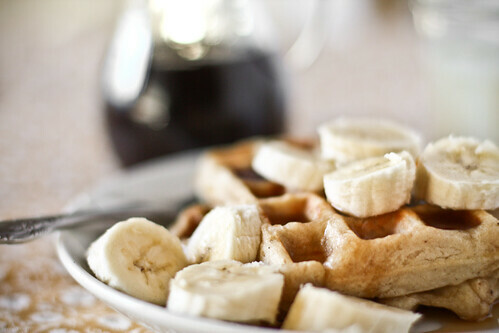 I never really thought to put together waffles and bananas but now that I see it it looks Amazing! Ohhh humminah hummniah humminah looks delicious! These look like just the thing to start the day. Can I put an order to go?!? These are just mouth watering. 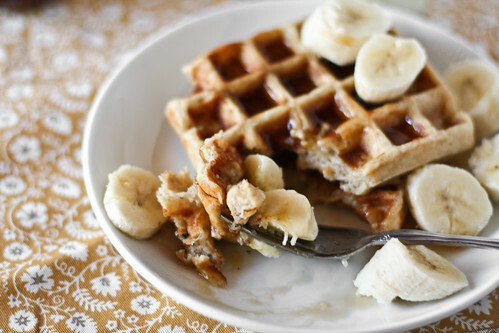 I haven't had waffles in ages, and never with bananas - these are mouthwatering! Yay! So happy to hear that you appreciated their tang - I was concerned that people would expect a muffiny sugar bomb of a waffle. And this one isn't that. Beautifully done! Oh yum! I am also a breakfast person and can eat it any time of the day. Love these and will have to try them!! Hannah, one of my twins just told me that I needed a waffle maker and that if his friends' moms can make good waffles he KNOWS (he emphasized) that I can too. 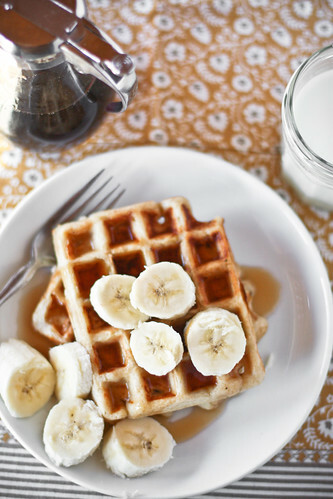 LOL You think seeing this yummy banana loaded post and recipe a hint from fate telling me I need to make my babies waffles? 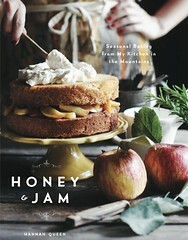 I need to make these and soon! I loves me some waffles. And banana bread. And yeasted baked goods. These look awesomely delicious! Thanks for sharing them! About how many waffles does this recipe make, Hannah? Looks delicious. I love yeasted waffles. Mmm I love breakfast at all hours too! Those waffles look amazing! Great photos. Yum. I love waffles, but I just never realize I'm going to want them the night before. Making the batter ahead has a lot of advantages. I'm going to give this a try--thanks for the inspiration. These waffles looks so amazing, I could just imagine eating them anytime of the day or night. Oh, this looks amazing! I have to try! Your waffles look beautiful, but I know mine would not turn out that well. I typically end up with waffle batter overflowing all over my countertop! Maybe I should just go to your house for breakfast! such stunning photos! they look so good, i may have to make them for dinner. 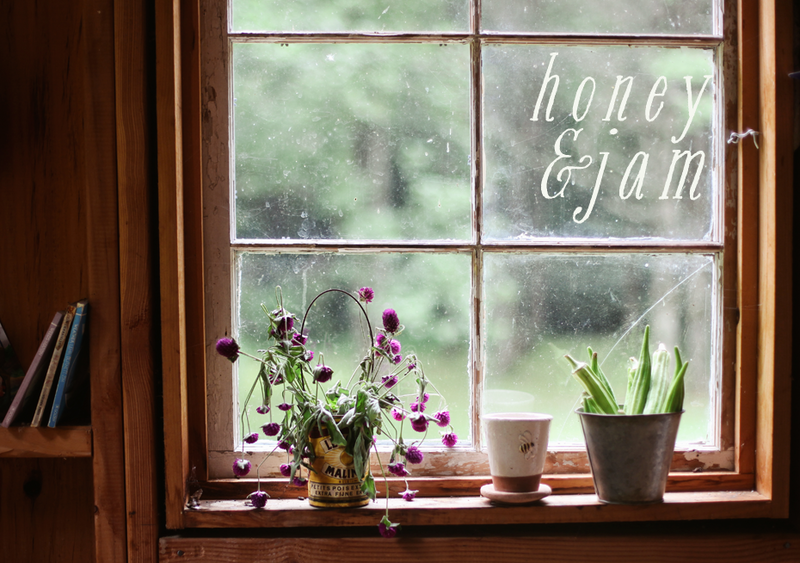 I just discovered your blog and I love the atsmosphere, it's soft, natural and cosy... And I love breakfast food too :o) Your pictures are gorgeous, I'm in love with your banner ! You're so cool! I don't think I have read through a single thing like this before. So nice to discover another person with a few original thoughts on this subject. Seriously.. many thanks for starting this up. I enjoy that post. It's great, that will article author chose to compose within this design. May seem like he what is yacon or she is broadminded particular person. I'd really like to see his or her yet another posts along with good enjoyment. It is truly incredible. Wonderful subject and fair ... you simply have to do more study to come to be many more specific. Yet it's not that bad, it's amazing. very tasty banana bread yeasted waffles . its going to be a delicious breakfast . i will try this . I am a gourmet and i love to try something new in taste.